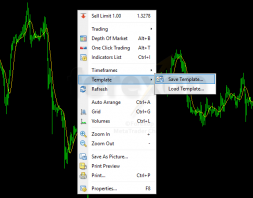 A useful feature in Metatrader is the ability to save a chart as a template. 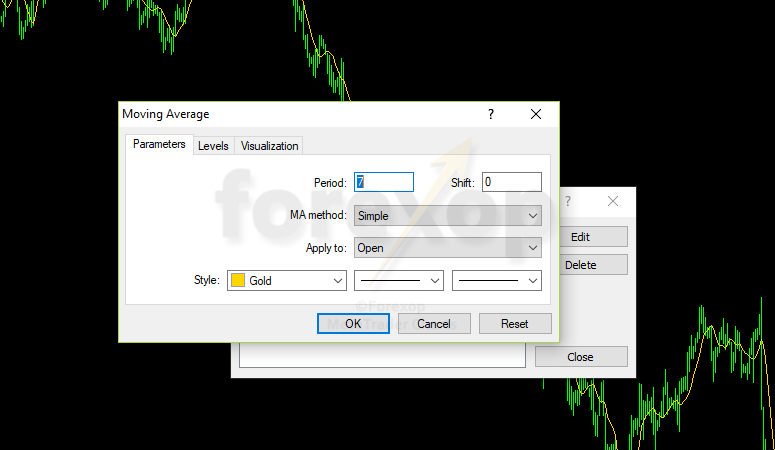 When you save a chart template you retain all of the settings and those settings can be retrieved again quickly. This includes any indicators or experts being used along with their parameters, the chart properties, colors and any other settings. Templates save time because once saved you can then re-apply it quickly to any other chart. 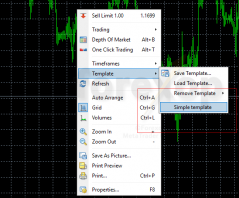 You can also share templates with other traders and download ones for specific types of technical analysis. Before saving a template, it’s a good idea to first make sure all of the settings you want to keep are ready. Select the chart you want to save then right click with the mouse anywhere in the chart. This will display the pop up tool menu. This example chart has just one indicator, the moving average. Next choose Save Template from the menu. You’ll be prompted to choose a name. Enter the name and then click on Save. To check that it has been saved, right click on the chart again and select the Template sub menu. Any user defined .tpl files stored in the template directory will appear in the list. The newly saved template is stored as a new .tpl file and should now appear in the list. To load the template onto a different chart, select the chart you want to apply it to. Right click with the mouse to reveal the menu again. Then select the name of the template you saved in the step above. The saved template will be loaded onto the new chart, together with all of the previous settings. Be aware that this step will remove any of the previous settings on the chart. Templates can’t be edited once stored. But they can only be overwritten with a new one. The easiest way to modify a template is to load it, make the changes and then save it again with the same name.